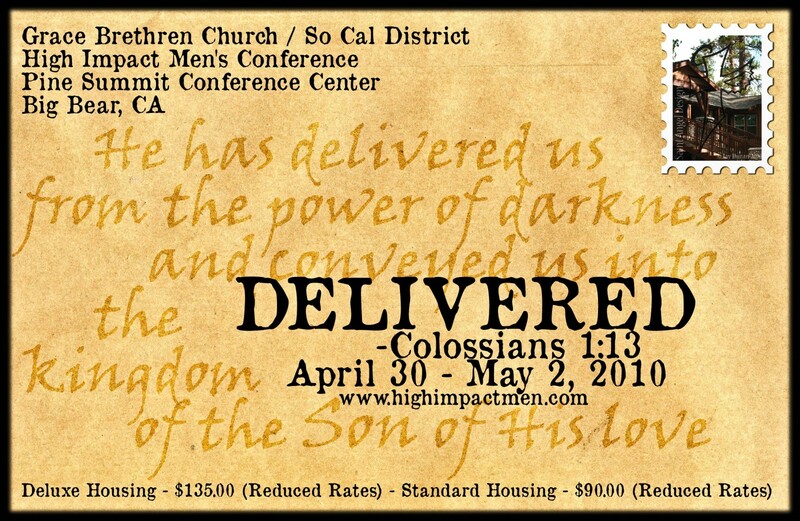 The 2010 GBC High Impact Men’s Conference for the Southern California District is quickly approaching . There are currently postcards and registration brochures that are being printed this week and should be dispersed to each church by mid-February. Registration will begin at 5:00pm with the first session starting approximately around 8:30pm. 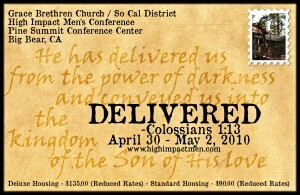 We are looking forward to another sweet time in the Word and in Fellowship together as men. Please begin spreading the word to your men and marking your calendars, if you haven’t done so already. Physical copies of the postcards and registration brochures should be available soon, however feel free to print out copies of the postcard if you want and when i get the finished registration brochure, i will email that too you as well. Also for those who have Spanish speaking ministries, there will be a whole High Impact Men’s Conference for Spanish speaking as well. Pastor Oscar Chavez will be the main contact for that so if you have questions regarding the Spanish speaking side of the conference please contact Pastor Oscar. Blessings to you all and if anyone has any ideas or suggestions for this years Men’s Conference please email me or call me.